For the multi-tasking worker, the typical 27-inch computer monitor may no longer be enough. As more and more apps are necessary today, the demand for larger computer screens has become apparent. 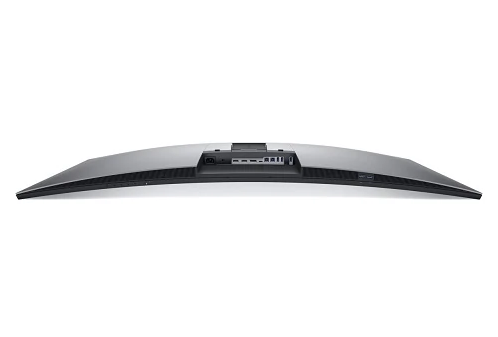 Dell’s answer to this call lies with the UltraSharp U4919DW. This 49-inch marvel is the first of its kind, and it features a QHD resolution. QHD, short for Quad High Definition, has a resolution of 5120 x 1440 pixels (sometimes referred to as 2K resolution). 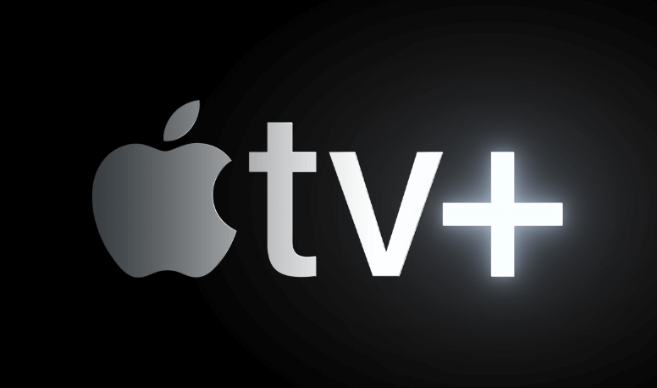 It offers four times the resolution of the standard HD display, which explains its name. Although it has a 32:9 aspect ratio, which is uncommon among monitors, it is still able to show screen elements in the proper proportions. It is possible to split the display into two 27-inch 16:9 views, giving you more space to comfortably show most of your running apps. Dell simplified the monitor controls: the U4919DW only has six buttons, including the power button. Labels are also displayed on-screen. Adjusting the brightness, contrast, and other settings is now more intuitive compared to other monitors with slightly complicated control panels. At first glance, the U4919DW looks like any other curved monitor with the typical gray and black color scheme and slim bezels. The monitor has a massive base to keep the 38-pound display stable. For those who prefer to have it elevated, 100 x 100mm VESA mounts can support it. Upon close examination, you’ll see that this monitor has more flexibility and productivity to provide. Two USB 3.0 ports exposed on the left side of the screen can be used to connect a mouse and a keyboard, allowing you to take advantage of the integrated KVM (keyboard, video, mouse) feature. It makes it easy to use two connected computers at the same time. Switching between the displays only involves setting a personal hotkey, and there is no need to reconnect anything. With its massive screen real estate, it is also possible to display both connected machines on screen at the same time. It gives you the opportunity to get creative with the organization of the displays transmitting over the USB-C, DisplayPort, or HDMI ports. It may take some time to get used to working with this huge display. Imagine having a 49-inch TV screen, which is typically only comfortable to look at from a distance, placed nearer to you. You will have to sit about two feet away from the screen. It might be impossible to look at the whole thing without moving your head. The curved display does help and gives excellent viewing angles whether the monitor is tilted upward or downward. However, despite all these incredible specs, the U4919DW isn’t recommended for gamers as the maximum refresh rate sits at 60Hz, paired with a pixel response time of 5ms. Even if you manage to have a graphics setup to compensate for this, some games will not adjust properly to its non-standard aspect ratio. Designers, video editors, and photographers may find the widescreen display tempting as well. But with Dell’s 99% sRGB color gamut, it won’t be as convenient to use for tasks that involve more detailed scrutiny of colors. 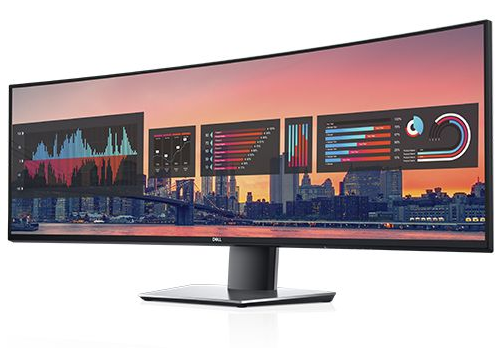 With the U4919DW, Dell is targeting the finance and business industry and the sort of users who work mostly with Office applications, or those who deal with multiple apps for different types of work. Dell is also smart enough to include its apps to increase productivity further. The Display Manager app (supported in Windows only) gives the user the option to choose from among 38 pre-defined templates for tiling application windows. You can also add a custom layout to match your preference. One handy feature, called the auto-restore, can keep track of the last window positions. Even when the monitor gets disconnected, the layout won’t change. The ultra-wide display of the U4919DW, unfortunately, comes with a high price tag. It is currently sold at $1,700, or $1,349 if it is on sale. Businesses may not find it worthy of their investment, and could easily settle for two 27-inch monitors that could provide the same productivity results. To conclude, the Dell U4919DW monitor presents a lot of options for increasing productivity. Boasting an ultrawide curved display, high resolution, and image customization features, it offers all the tools you could ever need in a work monitor. Top it off with the handy KVM feature that allows you to show two different machines in one display, and working with a laptop and a PC will be less stressful. Multiple ports such as HDMI, DisplayPort, and USB-C enable more types of devices to interface with the screen, too. It may take some time to get used to a 49-inch computer display, but it can conveniently split into two 27-inch QHD views for easier adjustment. Also, Dell’s Display Manager app adds an extra productivity boost since organizing windows in the display won’t be as tricky. If the price is not an issue and the demand for an ultrawide display is high, this behemoth is worth your money.